Here is a book babies can really sink their gums into - The Indestuctible Baby Book! Built for the way babies read, Indestructible Baby Books are printed on an amazing paperlike material that can’t be ripped, torn, or punctured. Indestructibles are 100 percent safe and nontoxic, and if they get too funky, just throw them in the washing machine or dishwasher. They’re made for baby to hold, grab, chew, pull, and bend, and are designed to create an even more special bond between reader and baby. The creators of Indestructibles are Amy Pixton, a mother of triplets, and her mother-in-law, Kaaren Pixton, an artist and children’s educator. Mama and Baby! is about mothers and babies of different species. Jungle Rumble! is about creatures in the wild. 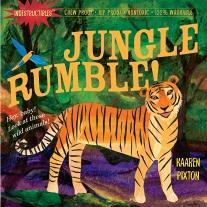 Kaaren Pixton’s art is bright, swirling with color, and reminiscent of Eric Carle, and it attains an almost 3D richness on the special paperlike stock of the book. Kaaren Pixton is a fine artist and children's educator who has been making art with children for thirty years. The idea of printing books on rip proof, waterproof, paperlike material was developed by Kaaren and her daughter-in-law, Amy Pixton, a mother of triplets who came up with idea after bits of traditional board books found their way into her babies' mouths. Originally from Ireland, Kaaren lives in Portland, Oregon, and is the proud grandmother of eight. Amy lives in Kansas City, Kansas, with her husband and their three children.